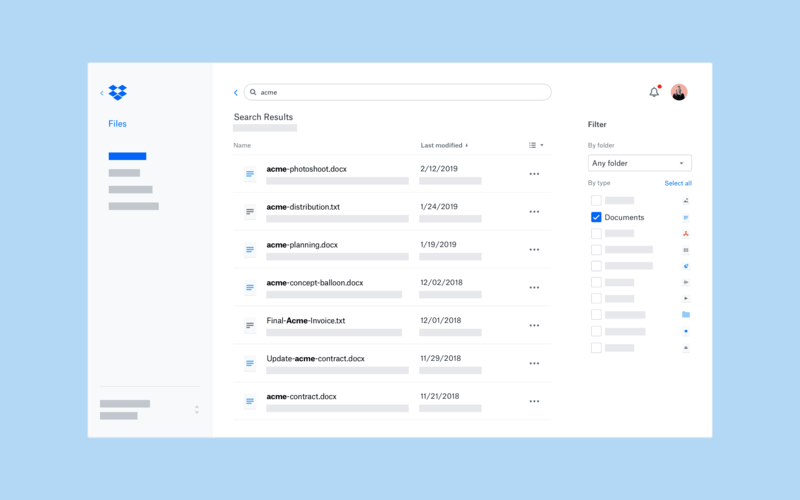 Dropbox has Finally Introduced much-needed Search Bar and File Filtering Features, in Addition to Testing out some more! HomeSocial NetworkDropbox has Finally Introduced much-needed Search Bar and File Filtering Features, in Addition to Testing out some more! Dropbox has finally heard its users’ demands regarding a convenient search feature on its desktop version. The new function allows you to access a search bar right when you click on the Dropbox icon, found in the system tray (for Windows) or menu bar (for Mac). The search bar will not only allow you to retrieve saved and synced files, but also everything else in the Dropbox account that might be in accordance with the searched query. Moreover, you will also be able to search for text or phrases in the files, if you have upgraded the account to Dropbox Professional or Business. That’s not all though, as the File Type Filtering feature has also found its way to the web version. As the name suggests, it will allow you to filter the results based on the selected file type. The available types, as of this moment, are documents, images, PDFs and 7 others. Also, the optimized search function will make this feature even more convenient to use. According to Dropbox, it has already gotten 65% faster. Last but not the least, a sorting feature is also being tested which will allow you to sort results by date modified. This feature can prove to be helpful in cases where a recently saved or commonly used file needs to be accessed quickly. "These new desktop app and dropbox.com search enhancements are available now." announced John Hrvatin, Product and People Leader at Dropbox, in a blog post.